A beautiful hike through the forest in the Terino Volcano National Park. The waterfall, hot springs and blue lagoon were sights you will never see anywhere else but here. This is the waterfall at Rio Celeste, a river in Costa Rica's Tenorio Volcano National Park. The water is actually this dazzling blue color because of volcanic minerals below the surface-- it's the real-life version of an effect . The hike is approximately three miles (4.8 kilometers) long and considered intermediate.The hike begins on a trail surrounded by thick, lush tropical rainforest along the Celeste River. Your naturalist guide will match a pace that is comfortable for you and tell you all about the rainforest, including exotic plants and wildlife, while you walk. The first leg of the hike ends at Los Teñidores, where two rivers merge to create the celestial, turquoise water that gives the Celeste its name. On the return hike, you will take a moment to relax in the “Ollas” – natural mud bath hot springs. 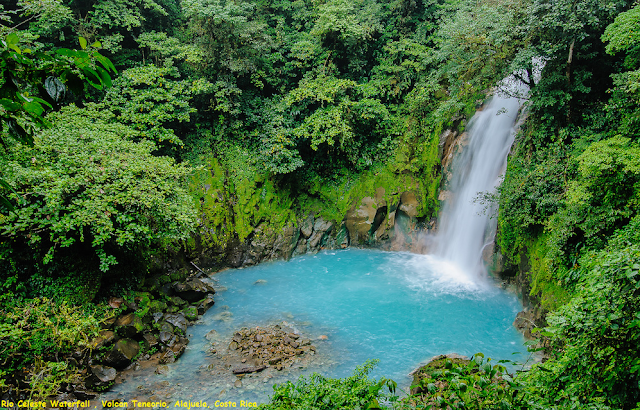 You will then walk to the incredible Rio Celeste waterfall – a photogenic falls and another perfect place to relax for a few minutes. The tour concludes with a delicious lunch at a local restaurant before returning to La Fortuna.